Because Milwaukee was playing baseball long before 1953. In 1943, the Milwaukee Brewers were searching for their first American Association pennant since 1936. America was at war, and FDR was in the White House. Bread cost nine cents a loaf, three pennies bought you a first-class stamp, and the average American annual salary was $2,500. A Brewer fan could look at this pocket schedule to decide which games he or she would be spending part of that salary on. This is a little larger than most pocket schedules; about 3¼ by 5 inches folded. On the cover, manager Charlie Grimm and mascot Owgust rally the fans. 1943 was a great year to "come out to Borchert Field and watch the Brewers play ball!". Owner/president Bill Veeck was starting his second year at the helm. The Brewers must have loved that photo of Jolly Cholly - they used it again on the pocket schedule the next year. On the inside, the list of games. Look at all those night games in red! The Brewers didn't play their first night game until June 6, 1935, and now eight years later the Brews were playing most of their games under the floodlights. Apparently when this schedule went to prees Veeck hadn't yet thought of holding 10 am morning games for war production swing-shift workersl the first morning game was held on June 5, which is marked here in blue as just another day game. I wonder when the idea first came to Sport Shirt Bill? 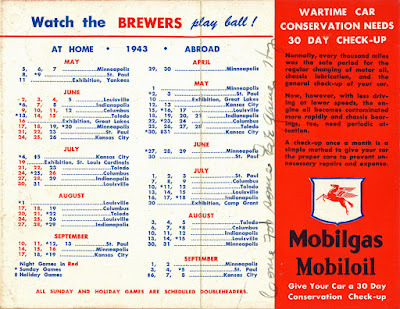 The Brews also had three exhibition games during the regular season; the Brewers would welcome the Yankees and Cardinals to Borchert Field, and would hop just across the border to play the draftees at the Great Lakes Naval Station in North Chicago. And in case you were wondering, the average price of a gallon of gas that year (presumably even MobilGas) was 15¢. 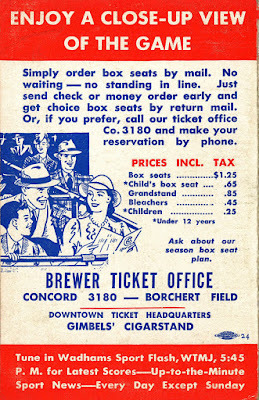 Even sixty years ago, teams were looking for ways to make ticket-buying as easy as possible for their fans. Buy them by mail, head on down to Borchert Field, call the ticket office at COncord 3180, or stop in to Gimbel's downtown to pick them up. And look at all those options. 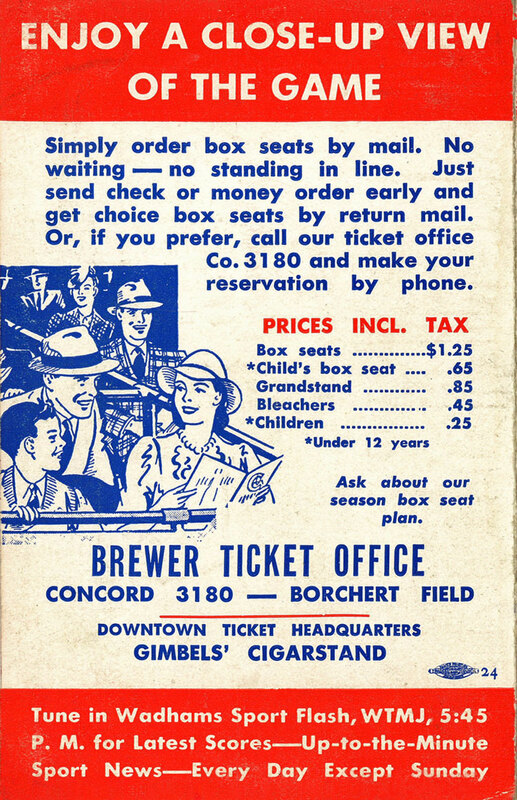 Box seats a buck-and-a-quarter, but kids could get 'em for sixty-five cents. Grandstands for 85¢ and the bleachers were forty-five cents for adults and twenty-five for children. When was the last time kids got a reduced rate at the ballpark? Wadham's Oil Company had been sponsoring the "Sport Flash", with "up to the minute sport news" since at least 1933. Even if you couldn't make it to the ballpark any of those nights, you could still get updates on the radio. For those fans who did get to Borchert Field, they saw some pretty good games. The Brewers finished 1943 with a 90-61 record, taking home the club's fourth pennant. 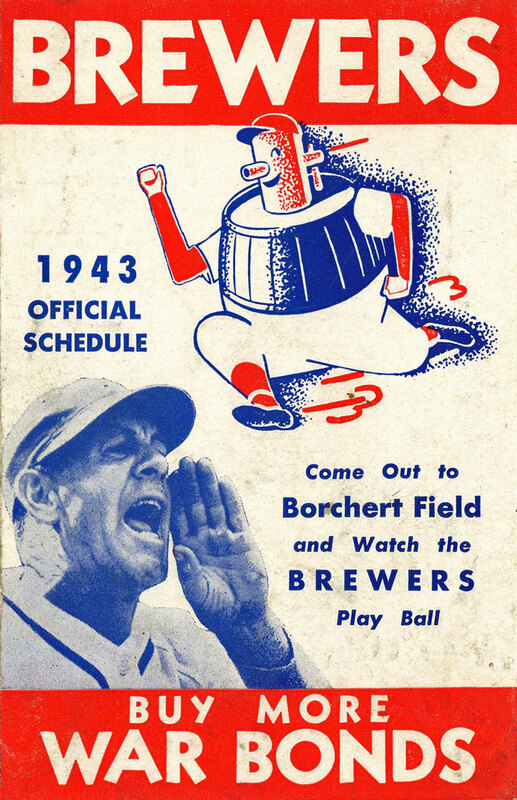 Welcome to BorchertField.com, the only online museum dedicated to the Milwaukee Brewers of the American Association (1902-1952), their ballpark, and all of the other events it hosted. For 2019, we're honoring the Milwaukee Chicks/Schnitts, on this 75th Anniversary summer of both their 1944 AAGPBL Championship and their one and only season. June 29th at Miller Park! Click here to send questions, hot tips or suggestions for future articles. Chance Michaels is a native New Yorker who spent many of his formative years in Milwaukee and developed a lifelong interest in the region's sporting history. In addition to his work with BorchertField.com, he runs the Green Bay Packers Uniform Database, an ongoing research project devoted to the design history of that other Wisconsin pro team. When not immersing himself in old game programs, wire service photos and newspaper archives, he produces theatre Off-Off-Broadway, and was formerly a contributor to The Onion. He lives in New York City with his family. Paul Tenpenny was born, raised in and is proud to be a citizen of Milwaukee, Wisconsin. Paul lives within walking distance of Miller Park and its predecessor, Milwaukee County Stadium. A lifelong collector of various antiques and collectibles, he specializes in Milwaukee and Wisconsin related Sports and Historic Memorabilia. Paul has been writing articles on Milwaukee Sports collectibles since 2007 and is in his 3rd year of writing his popular Vintage Brew series. An active member of SABR and its local Ken Keltner chapter, his memorabilia has been displayed at both the Milwaukee Historical Society, the Milwaukee Public Library and the Wisconsin State Historical Museum. Dennis Pajot is a life long resident of Milwaukee, who enjoys as a hobby researching Milwaukee baseball. He is an active member of SABR, both the local Ken Keltner chapter and the national group. His Milwaukee baseball publications include "The Rise of Milwaukee Baseball: The Cream City From Midwestern Outpost to the Major Leagues, 1859-1901" (McFarland & Company, 2009) (Winner - 2010 Sporting News-SABR Baseball Research Award) and "The Greatest Baseball Game Ever Played Anywhere" (Wisconsin Magazine of History, Spring 2009) detailing an 1899 baseball game in Milwaukee between City of Milwaukee officials and State of Wisconsin officials to help the sufferers of a tornado in New Richmond, Wisconsin. All content written by Chance Michaels unless otherwise noted. All original material is copywrighted by the respective authors and published here by permission. All team and league information, sports logos, sports uniforms and names contained within this site are properties of their respective leagues, teams, ownership groups and/or organizations, and may not be reproduced in any form without the permission of said entity. Copyrighted material is presented here under "fair use" and all attempts have been made to credit copyright holders. If you are the owner of any images presented here and wish to have them credited or removed, please contact us. This site is maintained for research and historical purposes only. Any information obtained from this site may not be sold to any third parties.